How much ventilation is required will depend on the building and the specific location. Factors such as type of soil, run off drainage, etc are all very important factors when evaluating sub floor ventilation requirements. How do I know if my building needs sub floor ventilation? 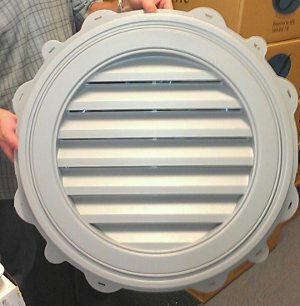 Well – if your sub floor is damp, musty, mouldy or smelly or you have fungi growing – you need subfloor ventilation! How does sub floor ventilation work? The purpose of sub floor ventilation is to replace the moist air with fresh dryer air. The simplest method used to achieve this is to install a number of vents in the wall around the building and rely on natural ventilation (air movement) to take care of the underfloor ventilation. View The Sub floor Ventilation Requirements here. Sometimes natural sub floor ventilation is sufficient, however often nature will need a helping hand. In order to ventilate more effectively, installing sub floor fans will enable you to extract moisture and damp/stale air from the sub floor area and replace it with fresh air drawn from the outside by one or more sub floor fans. 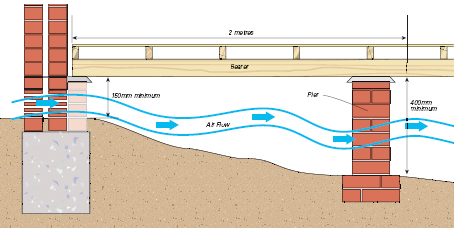 Sub floor fans may be installed to create cross flow ventilation -pulling fresh air from one side of the building through the underfloor area and extracting the moisture on the opposite side to increase underfloor ventilation. In order for cross flow ventilation to be effective – air should really only be entering from one side of the building and the sub floor fan should be extracting from the opposite side.If/when cross flow isn’t an option (or not effective enough e.g. due to pockets of non-moving air) – the sub floor fan can be ducted to one or more locations to extract moisture from central and/or specific damp locations. Credit to Pure Ventilation for diagram information. Check them out for more info on Subfloor Ventilation! When choosing where to set the sub floor fan system up to extract moisture from the sub floor it is important to bear in mind that in order to remove air – replacement air must be available and will normally be entering the sub floor area via vents placed in strategic positions. As there has been several requests for roof ventilation blog to look at sub floor ventilation options and alternatives – we will aim to explore the topic of under floor ventilation further over the next month or so.